The Bruins were expected to come out highly motivated after a disappointing Game 1 effort but fell flat on their face, giving up two goals in the first 2:20 and failing to find their offense for the second straight game. Montreal would score on a Mike Cammalleri goal 43 seconds in and followed with a Mathieu Darche goal less than two minutes later as the Canadiens beat the Bruins 3-1 to take a commanding 2-0 series lead back to Montreal. Still shaken from their Captain getting a late scratch, the Bruins gave up a goal in the first minute when a turnover in the Bruins zone quickly turned into a Mike Cammalleri goal. Johnny Boychuk made a bad pass across the zone that went right to James Wisniewski. Wisniewski then put a low shot on net which Tim Thomas kicked aside but Cammalleri was there to tap in the easy rebound for the critical first goal. Dennis Seidenberg wouldn’t help the cause when he was called for interference after a heavy hit behind the Bruins net. The Canadiens scored quickly on the power-play when Mathieu Darche snapped home a shot from the weak side. 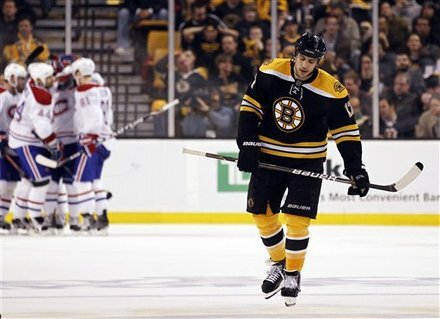 The Bruins clearly missed Zdeno Chara on the power-play as the Habs had no problem playing around the goal line. Cammalleri dished to Darche from one side of the crease to another, Thomas couldn’t get over and it was 2-0 less than three minutes into the game. The Bruins started to play physical at this point and recklessly in the offensive zone. Desperate to score a goal, they began throwing anything and everything on net. The Bruins tenacity did earn them the first power-play of the game at the midpoint of the period when Roman Hamrlik was called for roughing. The power-play was soon nullified when Nathan Horton was too called for roughing on a play behind the Montreal net less than 30 seconds into the power-play. After the penalties expired the Bruins would spend a good deal of the period with the puck in Montreal’s half of the ice and despite playing tenaciously, couldn’t really test Price consistently. The Bruins would earn another power-play with 32 seconds left in the first period on a good piece of forechecking. The Bruins would end the period with a 15-8 shot advantage but the Canadiens did all the damage in the first 2:20 of the game. The Bruins wasted their power-play, once again getting shots on net but not any high quality shots. A few minutes in, Milan Lucic was called for high-sticking on PK Subban, giving the Canadiens a chance at a three-goal lead. The Bruins killed off the penalty with four or five clears but nearly gave up a breakaway goal to Tomas Plekanec right after the penalty expired. Thomas made the save, a huge one at the time. Patrice Bergeron got the Bruins on the board, finishing off a nice bit of passing with a tap-in goal from the paint. The Habs overcommitted puck side, allowing Mark Recchi to dish to Brad Marchand on the other side of the ice. Marchand then found Bergeron streaking middle for the crucial third goal of the game. James Wisniewski hit Rich Peverley from behind which brought on a fight with Shane Hnidy. The Bruins would retain the power-play and benefitted from losing Wisniewski for five minutes. The fight got the fans into the game and gave the Bruins a ton of momentum for the power-play. The Bruins went with four forwards on the power-play and used a lot more movement than usual. The Bruins would hit a post during the power-play but couldn’t score. Yannick Weber would get the Habs cushion back when the Habs intercepted a pass in the neutral zone leading to a Lars Eller shot that rebounded weak side to a streaking Weber who put it in past Thomas. Thomas’ rebound control on the blocker-side shot should have ended the play but gave Montreal a huge goal late in the second. The Bruins would hit a post a shift or two later, their second of the period, but otherwise couldn’t get many shots on net and went to the second intermission in a two-goal hole. The Bruins would earn an important power-play after a nice grinding shift by the fourth line, desperate to get a goal after going 0-3 in their first three attempts. The Bruins got a bunch of looks on Price, had the Habs scrambling, but still couldn’t get Price or the defense out of position enough to score. The third began to look strikingly similar to Game 1 in that the Bruin recklessly fought in the offensive zone, threw anything and everything on net, and still couldn’t score to save their lives. Montreal defenders blocked a bevy of shots and Price controlled rebounds when he needed to. The Habs blocked 21 shots through the first 50 minutes to the Bruins grand total of five. Montreal began to ratchet up the intensity in the final 10 minutes, grinding out long shifts in the Bruins zone and proving that the best defense is puck possession. With two minutes left the Bruins pulled their goalie, needing two goals to get it to overtime. The Bruins took a timeout with 1:26 left but couldn’t muster any offense, and the game went to Montreal. The Bruins now take an 0-2 deficit into the loudest barn in the league. It’s not looking good, folks.